← Are our politicians in danger of having to express a view in the near future? This entry was posted in Ashton Vale, Bristol, Bristol South, Developments, Local government, Planning, Politics, World Cup 2018 and tagged Ashton Gate, Bristol City FC, Tesco. Bookmark the permalink. Shows that they know they can’t justify a Tesco in its own right – they can only do it by claiming it’s an ‘enabling development’ and raise the hype until the politicians feel bullied into agreeing. 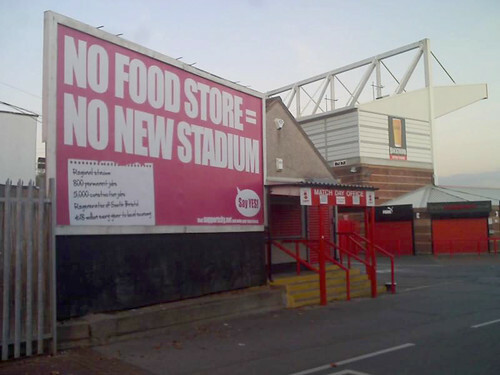 Apparently, looking at that hoarding, the entire regeneration of the whole of South Bristol is utterly reliant on the building of a superstore at Ashton Gate. Forget investment in employment opportunities, forget improvement of education facilities, forget decent housing provision, forget public transport infrastructure, forget the new hospital, the healthplex and anything else you might normally think of as ways of regenerating an urban area because they are all wrong. All of the above is utterly useless investment unless we are able to buy our tins of baked beans from a third major supermarket in the Bedminster area! Poster wouldn’t last long on North St. Still waiting for gutless Lansdown/Sextone or any of their gophers to explain all these benefits at a public meeting. Oddly, using retail jobs to regenerate South Bristol was quite specifically rejected by Lib Dem Cabinet member, Mark Wright, over on the Ring Road thread. Our aim is to “open up” (yes, that’s right) outer south Bristol for real business and industrial investment that brings jobs – aspirational jobs, not just retail jobs – to the area for the first time in generations. Is the local football team now running South Bristol’s economic policy? But why would anyone in their right mind take economic advice from a business losing £2m a year? 69 queries in 1.112 seconds.